We recommend visiting from 8am until 8pm, after that time we lock our doors as most residents are asleep. But you are welcome to visit 24 hours a day. Please call in advance for after hours visits to ensure access. What role does Social Services play at Rolette Community Center? Our social service team assists both residents and their families during transitional periods. They also provide essential information, manage requests and concerns, help in care and, manage discharge planning for each resident. They can arrange professional services for: Dental, Vision, Podiatry, Audiology, Power of Attorney, Dementia assessment, Psychosocial and Psychiatric Evaluation, and Individual therapy. Should you wish to have your laundry washed by us, please notify the front office upon admission. Subsequently, if a family/care giver is going to take care of the laundry at home, please let the nursing station know your plans. This way, the staff can place a sign on the closet door notifying our housekeeping staff to leave the clothing for family pick up. We request that family provide a hamper for clothes and pick it up twice a week. Although we do not have a formal policy stating visitation guidelines, we suggest using the common areas of the facility to meet with your loved one. If it is not possible to visit in one of the common areas, we suggest a limit of one to three guests in a resident room at one time. For the safety and welfare of all residents and staff, Rolette Community Care Center is non-smoking facility. There are designated smoking areas in the outdoor areas. Yes, we have beauticians available on Monday mornings. 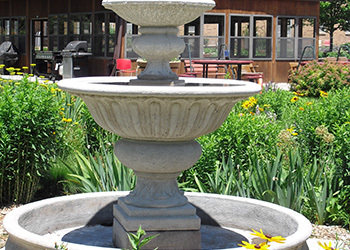 Rolette Community Care Center has a vibrant atmosphere with dynamic, individualized activities that match the capabilities and needs of residents and their guests. We also have active resident and family councils and volunteer programs. Scheduled activities include: music, fitness activities, religious meetings, outside entertainment, games, gardening, field trips/outings and volunteer involvement. If you would like to arrange something special or have suggestions and ideas for individual or group activities, please inform our activities director. We welcome and encourage involvement from family and friends. Our primary concern is that your loved one feels comfortable here at Rolette Community Care Center and that their needs are being met. You should feel secure and at ease with our staff, particularly those providing direct care. If you have any concerns or praise for our staff, please feel free to contact our social services department. They will be able to address any apprehensions you may have regarding any particular staff members. An LPN provides basic bedside nursing care to residents under the direction of a physician or registered nurse. Duties within the scope of practice for an LVN typically include, but are not limited to, provision of basic hygienic and nursing care; measurement of vital signs; basic client assessment; documentation; performance of prescribed medical treatments; administration of prescribed medications; and, performance of non-medicated intravenous therapy and blood withdrawal. What happens when my loved one’s stay at Rolette Community Care Center is over? What options do we have? If you are ready to take the next step in your recovery, Assisted Living is a natural progression. Assisted Living centers (sometimes called Retirement Centers) provide care for seniors who are healthy enough to not require nursing or therapy, but are not quite sure if they are ready to transition home alone. Assisted Living centers cater to seniors who want a more “homelike” environment but with the added security of someone to check up on you 24 hours a day. Services typically include medication management, a wide array of activities, transportation to doctor’s appointments and outings, furnished rooms, healthy and balanced meals, and socialization. Assisted living residences are registered, licensed or certified at the state level, usually by the Department of Health. Prior to discharging home, make sure to think about the environment you will be returning to. How many steps do you have to climb? Do you have adaptive equipment to aid in bathing? Who will be providing you groceries and cooking? How will you get to doctor’s appointments or the pharmacy? Can you care for yourself independently? Senior housing is apartment or condominium properties for persons age 55 years or older. Senior housing complexes do not generally provide meals or personal care services to residents but they may offer social activities, transportation or other services. Services will vary depending on size, location, necessity and cost.